The African proverb says it takes a village to raise a child. 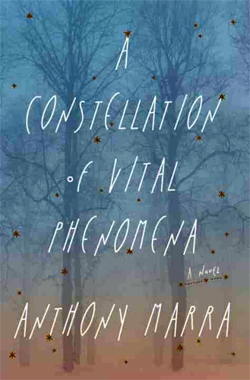 In Anthony Marra’s magnificent novel, A Constellation of Vital Phenomena , it takes a village to save a child from Federal assassination during the second Chechen war. The book opens with Akmed, a failed physician, and an eight-year-old girl, Havaa, overlooking the smouldering remains of her modest home, burned to the ground the previous night by the Feds, who abduct her father to a torture camp called the Landfill. Man and girl, Akhmed and Havaa become a family forged by fire — made but not chosen. Knowing the Feds will return for Havaa, Akhmed takes her 11 kilometres to the safest place he knows, to Hospital Number 6 in Volchansk. There Akhmed appeals to Sonja to harbour Havaa in exchange for his labour. Sonja, a brilliant prodigal surgeon, abandoned London to return to Volchansk at the start of the first Chechen war in a bid to find her sister Natasha, the only living member of her family. This is a beautiful book that explores families made but not chosen: from Akhmed and Havaa, to Sonja and Natasha, two sisters — one brilliant, one beautiful — who struggle to express love for one another, to six formerly domestic, now feral dogs whose pack leader, Khassan, is a taciturn former university professor and father of the local informer. This is a community of people “whittled by the deprivations” of war, corroded by betrayal, guilt, guilt by association, and shame, yet somehow humanity survives. This book is definitely worth your time. Be prepared for your soul to be touched, for your own humanity to be forever altered on reading it. I’m grateful to my friend Erik Westra for recommending I read A Constellation of Vital Phenomena . I read it twice, back-to-back, savouring the story told in plain, yet beautiful language. It’s a masterpiece of a novel I will never forget. Akhmed’s head hummed with the shock of how not shocked he was. What Ramzan said made sense to him. He understood why the Feds would want to kill a child. Accompanying that understanding was a second, equally shameful recognition: this incomprehensible war would take from him even the humanity to find it incomprehensible. When the field commander departed, and the double doors swung closed, Natasha returned to the maternity ward almost believing the war had left with him. Six days later the Feds would enter the city. They would launch a single mortar round at the hospital in retaliation for sheltering rebels. That round would hit the fourth-floor storage room. Maali would be searching for clean sheets. She would land atop the rubble, four floors below, her pulse slowing in her wrist. A syringe would be prepared and half injected, but death would relieve Maali’s pain before the drug took effect, and the senseless, screaming world would go quiet when Natasha slipped that same syringe between her toes, and with a push of the plunger, sent Maali’s blood into her own.